A rocky hillside dotted with whitewashed, terra-cotta roofed houses is on one side of you. Blue-green water sparkles on the other side. The dusty road in front of you is lined with fragrant jasmine and bougainvillea. And the port ahead is filled with both enormous yachts and small fishing boats. You roll down your car’s windows, but you find no relief from the relentless sun. As soon as you find your hotel, quickly change, and jump in the water, your first day in Greece will be perfect. Except you’re not in Greece. You’re actually in Kalkan, Turkey. You’re forgiven for thinking otherwise, though. The Lycia region was part of Greece until the Greco-Turkish War in the 1920s. Then Kalkan’s language became Turkish, and its Greek Orthodox church was turned into a mosque. But not much else changed. The weather is always beautiful. Restaurants serve just-off-the-boat seafood. And the coastline is stunning. That dusty road finally brings you to Villa Mahal. The small hotel has only 13 rooms. They’re built into the hillside and positioned for drop-dead gorgeous sea and sunset views. The crescent-shaped infinity pool and the restaurant have the same view, of course. The gardens are filled with olive, fig, and lime trees. The beach club has stone terraces built into the steep cliff. 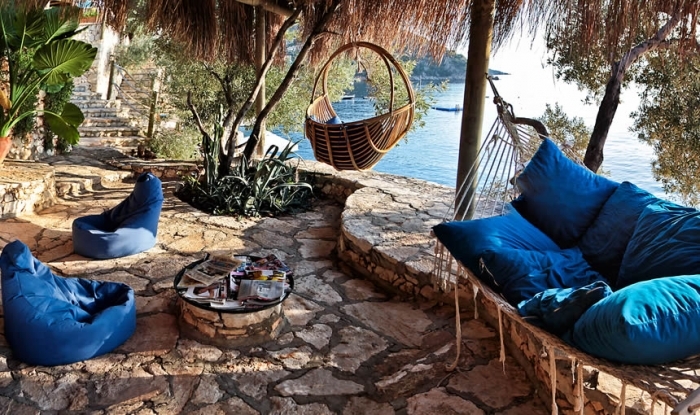 And there are plenty of hammocks, oversized cushions, and loungers in which to relax. Relaxing here shouldn’t be a problem. Ready for that swim? Slip off the platform into the refreshing water. Due to underground springs, it’s not as salty as you expected. Pour fresh fruit juice from the honor pool bar when you finish swimming. Find a beanbag chair to sip it in a shady spot. Move to the pool when the sun starts its descent. Your eyes dart back-and-forth between the perfect sunset and the cute village across the harbor. You’ll see Kalkan lit up later when you have a waterfront dinner—crispy calamari, pides cooked in a stone oven, grilled fish, and sparkling wine—with flickering candles. Still feeling relaxed, you sleep in the next morning before heading to the rooftop terrace for breakfast. You’re surrounded by morning glories as you eat fresh yogurt, local honey, lots of fruit (apricots, figs, pomegranates, and plums), and salty feta cheese. 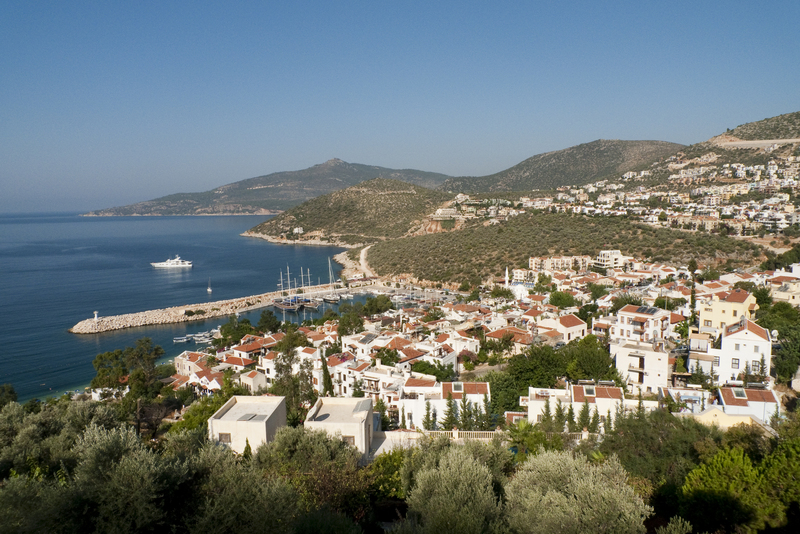 Then you ride the shuttle boat across Kalkan Bay to explore the village. As you walk through the stone alleyways, you pass whitewashed buildings with shuttered windows and timbered balconies cascading with flowers. Climb down 186 steps to Kaputaş Beach, a sandy cove in between Kalkan and Kaş that’s probably filled with British tourists. Go scuba diving around a shipwreck from the 14th century BC or canoeing down the Xanthos river. Stop at a cafe for an Efes beer. And wander the little shops for silver jewelry or a locally made carpet. Later, return to the harbor for dinner at Aubergine. The cozy restaurant has slow-roasted wild boar from the nearby hills and homemade desserts. Linger on a comfy white sofa while you finish your bottle of Boğazkere wine. And think about “accidentally” boarding one of the yachts instead of the shuttle boat in the harbor. You’re that relaxed on the Greek—oops, Turkish—coast.